Come with AVID......back to a time when the Keyboard was King (and King was a lanky one hit wonder and not a "cool " MTV jock!) Actually we blame those pesky krauts Kraftwerk and that balmy Bowie for all those bad haircuts and silly synths. 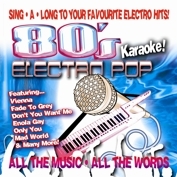 So get the eye makeup on, grab a pair of scissors and a mic and get ready to sing a long a synth to 80's Electro Karaoke!